When famous CEOs tell their stories, you are never quite sure if they their goal is self-aggrandizement or an authentic desire to recount something that will be of real interest to others. 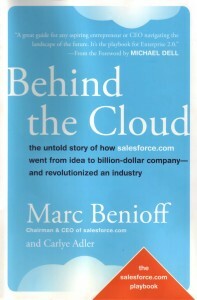 Marc Benioff has lots of reasons to be very proud of accomplishments, but his book Behind the Cloud: The Untold Story of How Salesforce.com Went from Idea to Billion-Dollar Company-and Revolutionized an Industry will be an inspiration to many. Not all entrepreneurs have Marc’s chutzpah, but his 111 recommendations to entrepreneurs will all be extremely precious to anyone. Sure, you may not dispatch a commando unit on bicycle to circle the Los Angeles Convention Center at a Microsoft launch event and instead settle for less spectacular tactics, but the message is clear: if you are an underdog, you can’t be too subtle either, and you have to find a way to force the big guys into adopting your message. Regardless of who they are. Frankly, when Tom Siebel from Siebel Systems started to talk about software-as-a-service after he acquired Upshot, most of us smiled at the recollection that only two years before, Siebel had been repeating that SaaS was the type of stuff for dot.com kids. “Don’t fear competition: welcome it and leverage it,” Marc concludes – provided, though, that you keep it under tight control. Great book. Very well worded (no siliconite verbiage), co-authored with an excellent writer, Carlye Adler.